Plum Gooood! That says it all for the new Plum flavor of Jelly Belly beans. Lush and ripe with just a hint of tartness from the skin of the plum. �The center is red, just like a summer plum and the shell is a standout, too, because Mr. Jelly Belly wanted it to resemble a plum. 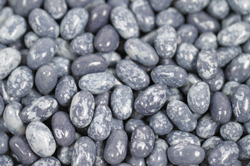 �It looks like no other Jelly Belly bean with a tint of light marbling over the dark blue shell.